You did the mash…the potato mash! Ever look at your potato masher and wonder about the story behind it? 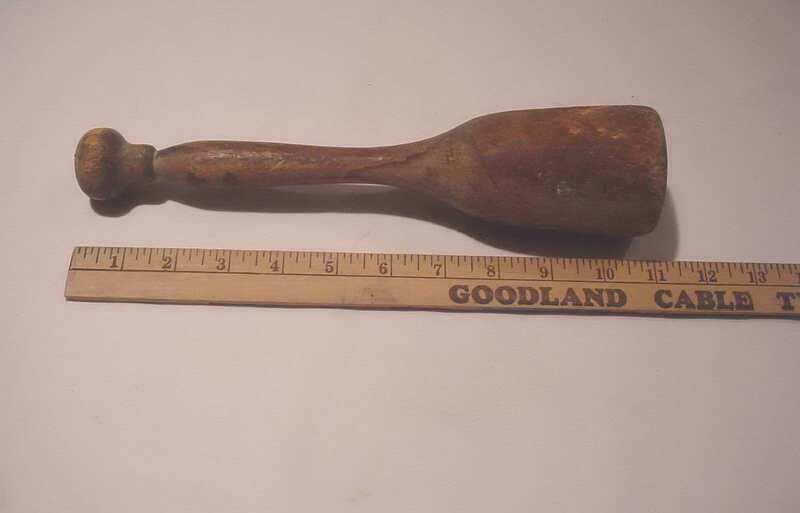 In our collections we have a wooden potato masher that while our object does not contain much history, the history behind the object itself is very interesting. The potato was domesticated by the Andean people of South America and it wasn’t until Christopher Columbus brought back a potato from the New World in the 18th century that the Old World became introduced to the plant. The potato helped save many people from famine in Northern Europe. Unlike wheat or rice, which if the plant grows too big the plant itself will fall over, potatoes grow underground so it is not dependent by the rest of the plant. When the potato first came to the New World the people did not trust this new plant. Suspicions started to arise about the potato, including that it was an aphrodisiac and could cause fever or leprosy. Many would not eat the potatoes and their monarchs had to order their subjects to eat them; this happened in Prussia when a famine struck and King Frederick the Great ordered the peasantry to eat potatoes. In France it took even longer for people to realize the benefits of potatoes, and it wasn’t until Antoine-Augustin Parmentier started to extol the virtues of potatoes that the people of France ate them. Parmentier was captured multiple times during the Seven Years’ War by the Prussians and during his time in prison he ate mostly potatoes. Originally not thought of highly, Parmentier eventually realized that the potatoes kept him in good health, and when he was released from prison he went back to France to tell everyone the nutritious benefits of this plant. Parmentier published papers about the potato but papers were not likely to be read by the public, so he had public demonstrations of what you could do with potatoes. It is believed that during one of these demonstrations he made mashed potatoes, also that Thomas Jefferson was in attendance and introduced French fries to America. Potato mashers are the oldest kitchen utensil we still use today. Wooden potato mashers like the one we have in our collection were often round, heavy wooden objects with handles and flat bottoms. Wooden mashers date back to the Pharaohs in Egypt. They would not only use the masher to mash vegetables and seeds but also grains to make beer. Throughout the centuries wooden mashers have stayed as a necessary tool in the kitchen. Many wooden mashers were handmade and besides mashing potatoes, they were also used to stuff finely chopped meat into cloth bags like sausage into its casing. Our wooden potato masher was donated by Lester Sage and is 11 ½ x 2 ½ x 1 ¼. While the potato masher may look a little different today they are still very similar. The materials have changed as well as the head; plastic and metal versus wood and instead of a flat base they have a zig-zag patter or a circle with squares. Whether it’s Thanksgiving or a favorite meal, potato mashers will always be useful in the kitchen. Can you think of any objects around your house that like the potato masher transcend time?